WILDWOOD RESORT Is Your Year-Round Minnesota Resort! Minnesota Family Vacations Are More Fun Here! Minnesota family resorts like Wildwood Resort are a special find. Once you’ve vacationed in any of our family-friendly cabins, we’re confident you’ll want to return year after year. We are a year-round family vacation resort located on the southeast shore of Bass Lake near Grand Rapids, Minnesota. There are a wide variety of family activities and adventures to experience with your entire family no matter what the season. No matter what your favorite time of year to take a family vacation is, Wildwood Resort offers activities for every season. Welcome in the Spring with us with fantastic fishing. Swim, boat and relax in the waters of Bass Lake in the Summer. Breath in the crisp fall air as you observe the beautiful fall color changes. Or, warm up in our comfy cabins after a Winter snowmobile trip. Take advantage of our off-season rates for a inexpensive family getaway or girls weekend. At Wildwood, we strive to carry on the traditions of unparalleled customer service and exceptional value that have made ours a leading family vacation resort since the 1930s. Our location is peaceful and serene, yet just seven miles from Grand Rapids, MN, where shopping, dining, and recreational opportunities are plentiful. (Take a peek at all the Grand Rapids Minnesota Attractions we have to offer.) Our Cabins are All New and are sure to make for a very comfortable stay. We cater to folks looking for family vacations, romantic getaways, family reunions, fishing vacations, fall color vacations, and all sorts of winter vacations in Minnesota. Whether you’re looking for a spring, winter, or fall vacation, we invite you to make your next reservation here at Wildwood. We’re excited to share why we think Wildwood Resort is the right Minnesota Resort for you and your family. 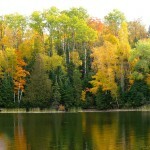 Our nine lakeside cabins are finished in beautiful Northwoods décor and are exceptionally clean. Several have been newly built in the past couple years and each offers breathtaking views of Bass Lake and spectacular sunsets. 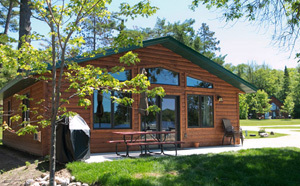 Our cabins are great for Minnesota family vacations and perfect for family reunions! Explore our resort layout and learn more about each cabin. Get away and experience the rich arts and culture of Grand Rapids. Enjoy a Reif Center Theater Package, which includes tickets and a three night stay for two in one of our cozy, year round cabins.